This is a scientific smoking trick as it shows you what happens to air in a vacuum. 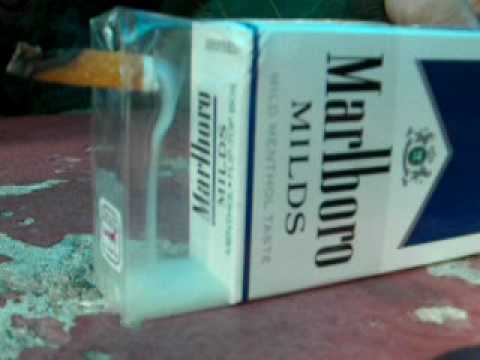 Pull the plastic wrapper about half way off the cigarette packet so it's still providing an air tight (more or less) connection to the pack. Then use a cigarette or something of that shape to burn a small hole in the side of the plastic, not too big that the paper will fall through but not too small that it won't fit in (This is the hard bit). Once you have done this bit remove the filter from the cigarette but and somehow make it fit into the hole. I usually give it a little fold until it's halfway in the hole. (You can use any type of paper for this bit. Finally light the end and your smoke waterfall will begin! And there you have it! The smoke waterfall trick with a cigarette packet. A simple yet effective party trick.